Athletics Northern Ireland have officially confirmed 15 nominees for next year's Commonwealth Games. Following an appeals process, there has been one change to the nominations order initially communicated to the athletes three weeks ago. 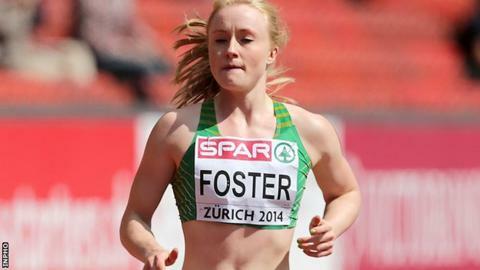 Sprinter Amy Foster moves up one spot to 12th ahead of Kerry O'Flaherty. 3,000m steeplechaser O'Flaherty thus returns to the 13th position she had occupied in the original rankings system. The nominations order is significant because there is no guarantee that the Northern Ireland Commonwealth Games Council will ratify all the athletes because of pressure of numbers across all the sports. Unlike Foster, Rio Olympian O'Flaherty had not met the criteria of achieving two Gold Coast standards. The Newcastle woman's higher Commonwealth ranking and a view that she would have a better chance of reaching a final in Australia is thought to have led to being moved above Foster in the provisional nominations before the sprinter's subsequent appeal. Another change sees the withdrawal of a 16th nomination for an additional 4x100m male athlete. There had been speculation that this was aimed at opening the door to Paralympic star Jason Smyth travelling to the Games to compete alongside Leon Reid, Ben Reynolds and Adam McMullen in the 4x100m. The initial provisional list of nominees and the nominations order was obtained by BBC Sport Northern Ireland earlier this month. An Athletics Northern Ireland statement on Tuesday said that the "list of athletes previously published by the BBC was preliminary and subject to internal ratification by Athletics Northern Ireland". The statement added: "We believe the list released on 23 October to be the best reflection of athletic performance throughout the qualification period, when judged against our selection criteria. "We have nominated a talented group of athletes across a wide range of events, including a great mix of experience and developing talent. "Athletics Northern Ireland looks forward to the announcement of the final team by the [Northern Ireland] Commonwealth Games Council early next year." The list of nominations led by European 1500m bronze medallist Ciara Mageean will be submitted to the Northern Ireland Commonwealth Games Council who will make the final selections on 2 January. With the Games Council having to select athletes in other sports for the trip to Australia, there were initial suggestions that as few as eight track and field performers might be ratified although a double figures representation is now anticipated. Marathon runner Laura Graham remains as the 15th nomination even though her personal best of two hours, 37 minutes and five seconds set in Berlin last month, was five seconds outside the Gold Coast standard.